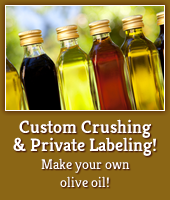 At Corning Olive Oil we have made Blends for Private Labels, Wineries and Chefs. We have blended for Companies that have won a number of Gold and Silver medals For California Extra Virgin Olive Oils. Most at the Pamona Fair which is the biggest Olive Oil Fair in the World. We make our own California Blend Olive Oils from different Varieties. Such as Mission, Manzanella, Ascalonos, Sevi and some Italian and Spanish varieties. We have Alfa Lavel decanters and centrifuges. We blend different Varieties for different Companies. Some Companies want a late harvest that is mild, buttery, fresh etc. others want an early harvest that is Fresh, Pungent, Nutty etc. So with crushing so many different varieties we are able to blend just about anything an individual Company would need. We are not a large bottle and labeling Company so we can do small private labels quickly and inexpensively. For any information on how to put together your own private label then. Buy some California Extra Virgin Olive Oil from us and have us bottle and label it. Please fill out you’re information on our contact page and we will forward it to the appropriate party within Corning Olive Oil and get back to you.